So, every Tuesday I go to the Humane Society of Washington County to do behavior assessments for adoption dogs, and every week I manage to resist some wonderful faces and personalities. We even play an “if” game at the end of assessments… Teasing ourselves a little we ask each other, “If you had to adopt one of the dogs we assessed today, which one would it be?” I’m pretty safe playing this game – we have five dogs in the family, with no intentions of adding another permanent canine resident. Five is our limit. However, that doesn’t preclude an occasional temporary addition. Hence, Squid. 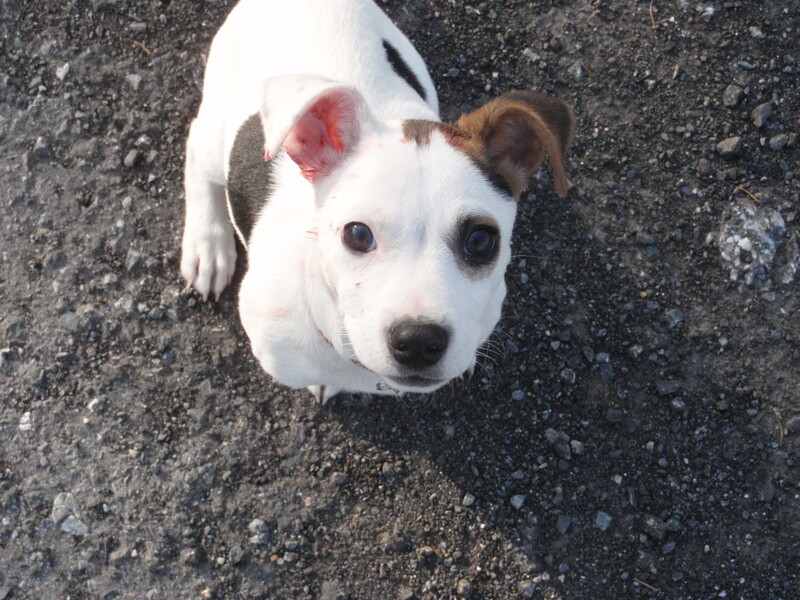 Three weeks ago we started to assess an 8-week-old Jack Russell/Chihuahua mix. He had already failed his assessment once for being ferociously mouthy, and they wanted a second opinion (mine). We started to assess, but his snuffling and sneezing convinced me he might have a little upper respiratory infection, so he went into isolation kennels for treatment for two weeks. He loves everyone (all species) and thinks everyone loves him. 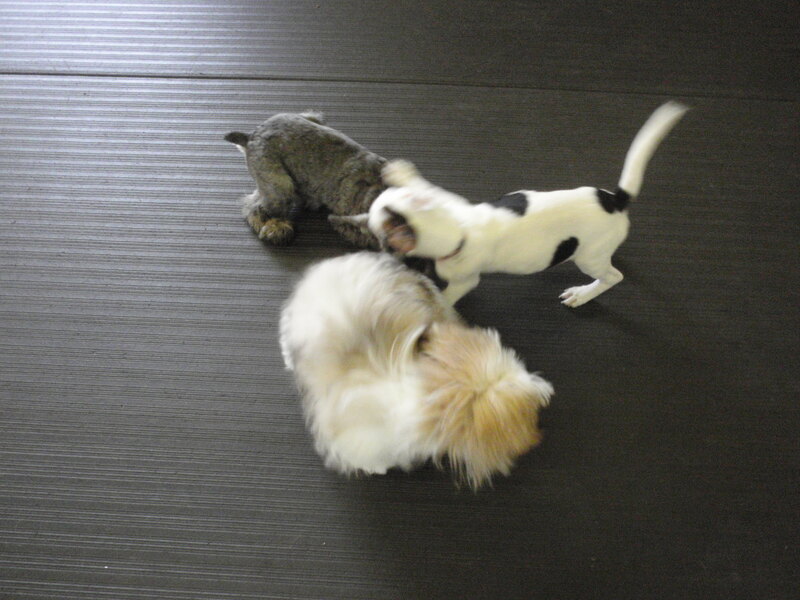 Playing with a Shih Tzu and a Schnauzer puppy in our Saturday puppy class. 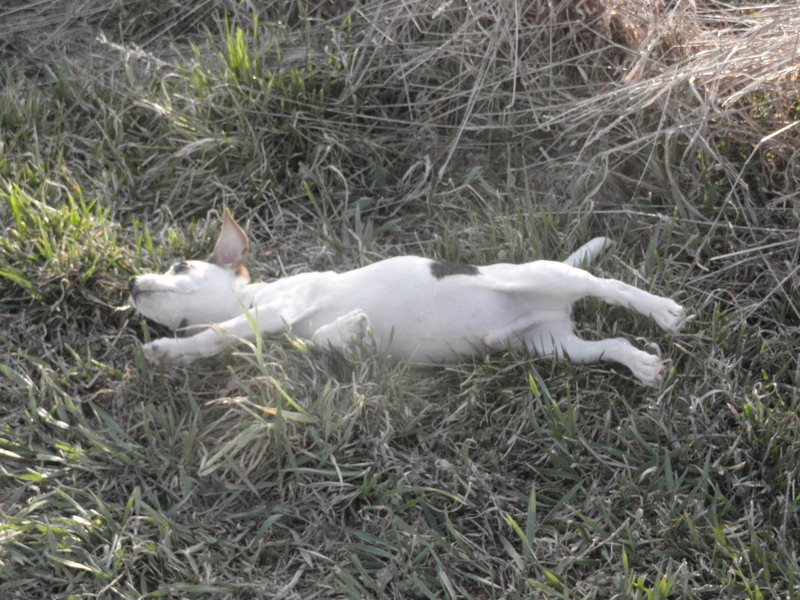 At age 10-12 weeks he tries devilishly hard not to soil his puppy pen or his outdoor kennel. He doesn’t always succeed, but he tries really hard. He is fearless. Resilient. Indomitable. Assertive. Nothing fazes him. He played with puppies three times his size Monday night, and never hesitated. He is smart. He has learned to sit to make the kennel door open, and did his first “verbal down” yesterday. He is fun. Loves to hike, play with toys, and fetches a tennis ball. 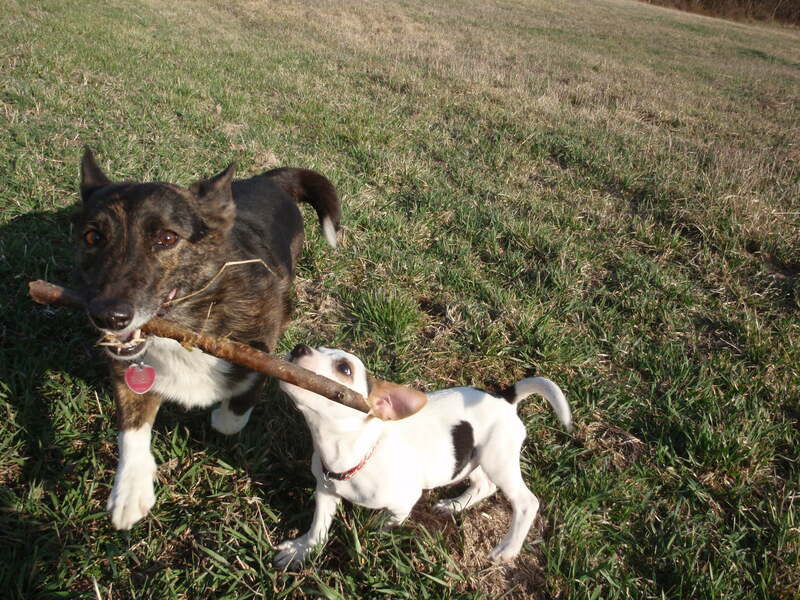 Helping Lucy fetch her stick (very bold, since Lucy does *not* share well). He is surprisingly non-vocal. Despite spending a fair amount of time by himself in his pen and/or his kennel, he isn’t barking much – only when he gets excited because he realizes someone is coming to see him. And yes, he is a little mouthy. Not half as bad as Maggie-the-Westie-puppy who was abandoned in a crate in our driveway last year, but yes, he does need to learn to inhibit his bite a little. And to stop using his mouth to get what he wants. So he’s actually a pretty fun project, and I’m hoping a pretty easy one. I’ve started counter conditioning his resistance to restraint and can already pick him up without any dental protest on his part. Amazing what a little “associate *that* with high value treats” can do! Actually, not all that amazing, I pretty much expected it to work, although maybe not this quickly. Next is teaching him that having someone look at his teeth is also a reliable predictor of really yummy stuff.I expect that to go quickly as well. I’d love to hear what kind of pup you think he is, from his pictures, and my description of his personality. 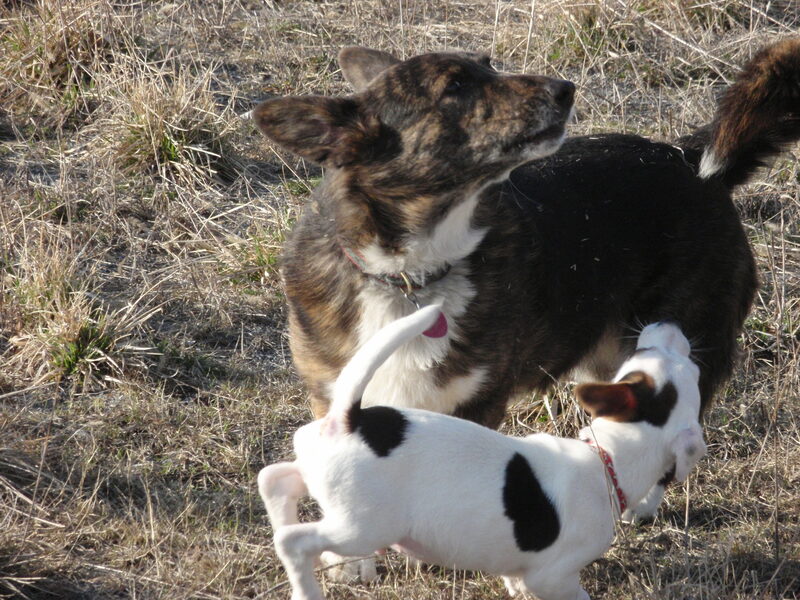 I see the Jack Russell, but I’m not seeing Chihuahua. Maybe all Jack? What do *you* think he is? I’m thinking he’s a great candidate for flyball, and since the flyball class meets here tonight, I may just have to go out and introduce him, and troll for some prospective adopters. This is more in character. I’ll keep you posted. And no, he’s not staying. Really. Hope that forever family comes along soon…he is adorable, but I think (if he were staying here) he’d never leave! Diane, i got pretty well immunized working at a shelter for 20 years. And cute as he is, he’s really not our “type.” But he *will* find a forever home, there is no doubt! My first thought was that he sounded like a great flyball prospect! LOL He doesn’t look all jack to me, something about the head looks a little too broad but maybe that’s just the photos. I thought he looked like a pit mix from that first photo. Maybe he’s a JRT mixed with pit or staffy bull? No doubt about the terminally cute part. My best guess about the “what else” would be another terrier type, perhaps a little bit of Bull Terrier? Squid is a great name but I am thinking a better name might be Lucky. Ha – Susan, shelter named him. I’d agree another terrier type, but I don’t see anything Bully, really. 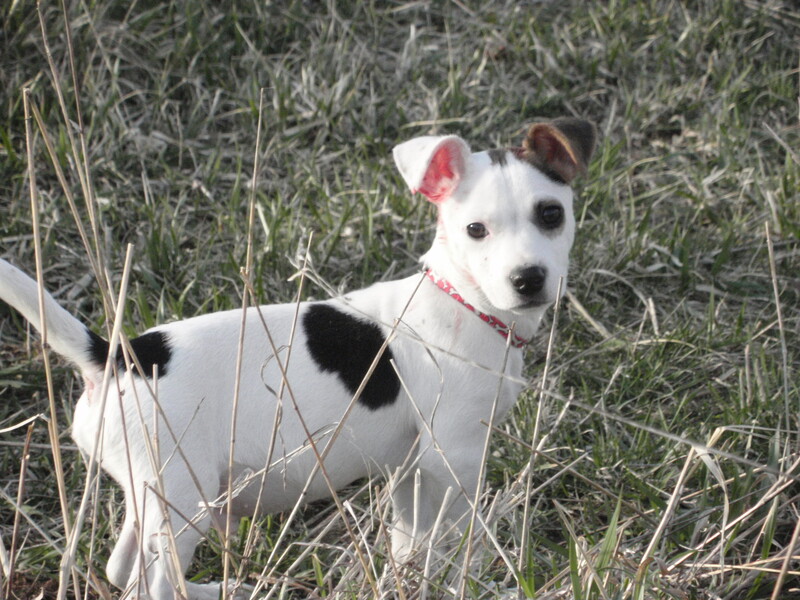 Can we say rat terrier? I think he is very cute, but of course, I’m bias. I’m not seeing Chihuahua either. He is adorable though. That much is for sure! Congratulations on your new *temporary* addition. He struck GOLD for sure! Really, Pat?! Not staying!? Terminally cute, indeed. My kinda dog… spunky, fearless, pesty. I’m thinking all Jack. I looked it up just to see if there might be an explanation of the ears. They sit so high. There was a puppy picture that could have been Squid, ears and all. I vote for JRT, through and through. Have a blast with him. Oh, my, he’s delicious. I want to put him in a TACO. omg! cannot wait to meet him! he is adorable!!! Too cute for words. Not a clue what besides JRT. 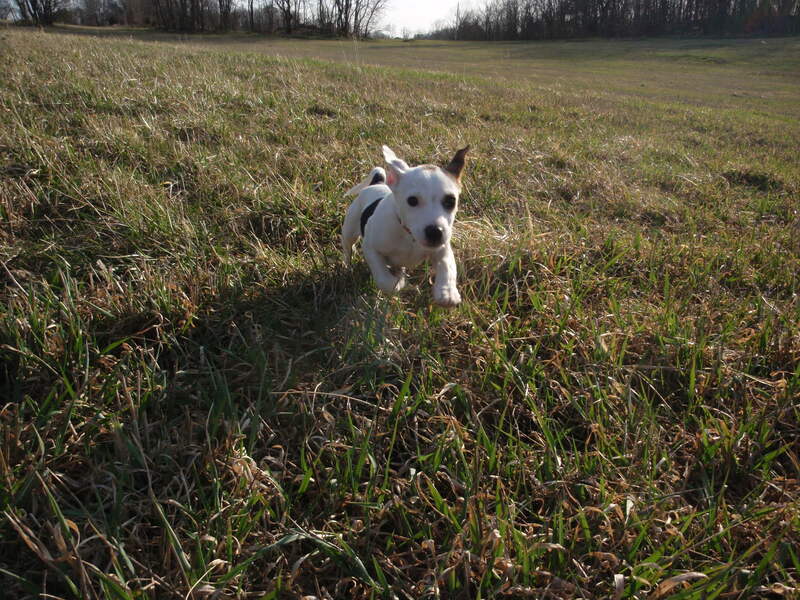 He really looks like a JRT in the picture where he is running toward the camera. I want to say Pit too, but that’s just because everything in NY is a Pit mix, even the poodles haha. Have lots of fun while you have him. 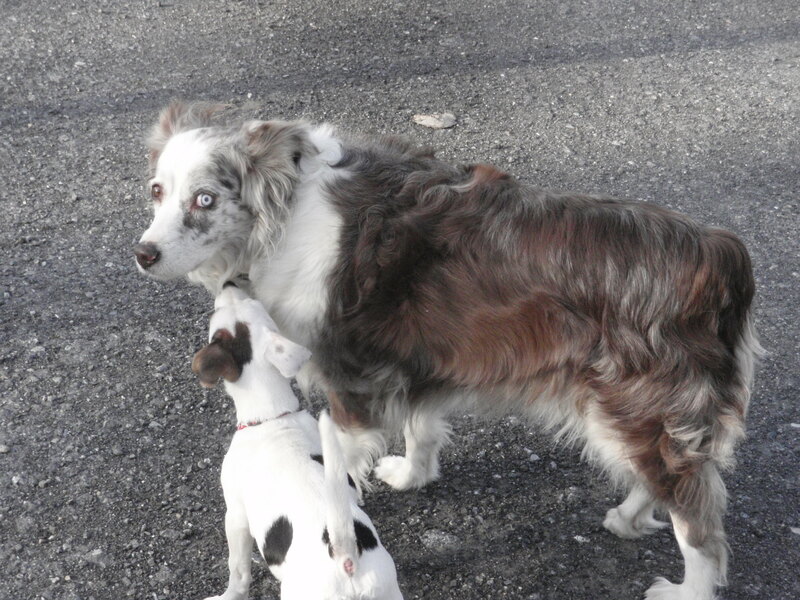 He IS terminally cute, but I must say that I was totally gobsmacked by Missy’s perfect “Aussie stink eye” LOL. If you come across an extraordinarily smart Aussie therapy dog prospect (yeah, I know, hard to find)that will give up toys and food to an Aussie with a worse stink eye than Missy’s, and likes goober hounds, call me:-))) Meantime, I hope you find a great home for Squid (love the name). I know you have saved a great little guy – the personality just oozes out of him! Among the JRT fancy, it is widely believed that Bull Terrier stock was mixed with Jack Russell Terriers to strengthen the breed. That is why you may be seeing Bull in there.